School in Malawi 2010 - Buddy Bear Help e.V. Following our experience with the Angola project, our organisation initiated building a nursery school in Malawi. Thus, we enabled the schoolchildren to follow the individual phases of the project realisation. They were able to identify even more with the situation in Malawi and to experience more directly how much fun it can be to help others – a very valuable experience for their future life. 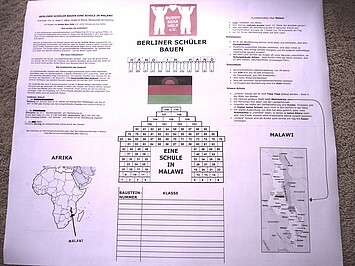 Again, we asked school classes to raise bricks worth €50 each. Patron of the initiative was the Berlin Senator for Education, Science and Research, Professor Dr. Zöllner. This enabled us to contact all schools via the distribution list of the Senate, inviting them to participate in the project. A competition was organised as part of the project and Senator Zöllner awarded a certificate to the three schools that (standing together hand in hand!) generated the largest amount of bricks. As soon as we received news on our building site, we informed the schoolchildren with a newsletter.